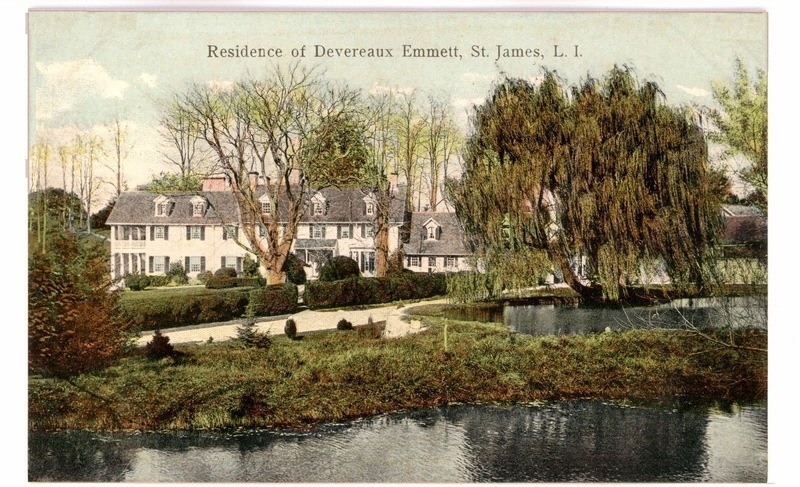 'Sherrewogue', the Devereaux Emmet estate enlarged by Stanford White c. 1895 in St. James. Click HERE and HERE for more on 'Sherrewogue'. Click HERE to see the residence on bing. Mrs. Emmet was the sister of Mrs. Stanford ("Bessie") White and Titanic Victim (and hero) James Clinch Smith. Smith witnessed White's murder in 1906 and, after the funeral, fled to Europe to keep the Smith family out of the scandal as much as possible. When it appeared that Harry Thaw was going to get off scot free, Smith reluctantly came back to New York and testified at the first murder trial - a surprise star witness for the prosecution. Smith's testimony probably made the difference between acquittal and the hung jury that resulted. Smith went down on the Titanic after assisting the crew with the so-called collapsible life boats just before the sinking. Smith's memorial can be seen inside St. James Church, not far from the Emmet estate. Stanford white's grave is located in the far end of the church cemetery, on the right side. My dad was the caretaker in the 60s. He would whistle 'Going Courting' and all the doves in the dovecote would come to be fed. I knew every inch of the property as a child. There was a 17th century graveyard right on Harbor road at the southeast corner of the property, anyone know if it's still there? Go look for me, I'm in California!